Kelly Gozdziewski will never forget the words spoken by her son, Lucas, after he received new prism glasses. Lucas had been putting the glasses on and then taking them off, when he stopped and looked at his mother. “Mom, I can see!” he said. Lucas was as amazed as his mother was happy. “He never knew there was a different world without those glasses,” Kelly said. The special prism glasses, prescribed by Dr. Heather Motisi of The Vision Therapy Center, were just one part of Lucas’s vision therapy treatment plan. Also included were six months of twice-a-day vision therapy, and a lengthy trip from Chilton to Brookfield once a week for in-office vision therapy. But the results were worth it. Lucas had discovered a new world in many ways. Lucas had encountered numerous medical challenges since birth. He has suffered from apraxia and sensory processing disorder, and he didn’t speak in complete sentences until he was five years old. Physically, Lucas struggled with motor skills. As a baby, he could not crawl. He struggled to sit upright, and suffered numerous head injuries because he was always falling. When he finally reached school age, he was academically behind his peers. No one was entirely sure what his struggles could be attributed to; his eye doctor ruled out any visual problems, as his eyesight was 20/20. But Kelly and her husband Tony knew there had to be a reason for Lucas’s struggles. 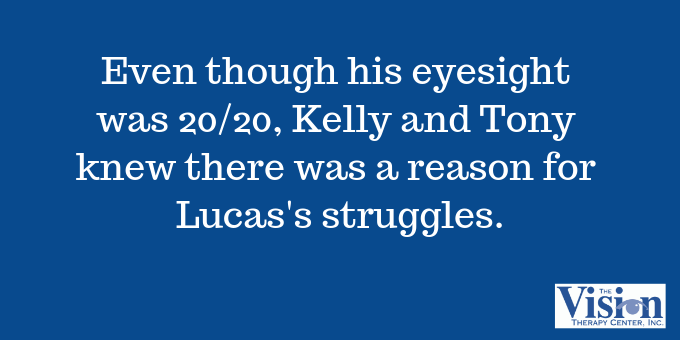 One day, a speech therapist asked Kelly if Lucas’s eyes had been checked. The therapist had recently seen Dr. Heather Motisi speak at a conference, where she described the symptoms of functional vision problems. Lucas had many of these symptoms. “Lucas was diagnosed with convergence insufficiency, irregular saccades, and accommodative insufficiency,” said Dr. Motisi. Lucas began a six-month treatment program, with his dad Tony providing much of the “determination and motivation,” Kelly said. The therapy focused on his eye movements and fixation skills. “We had to be creative in offering up different variations and targets with the activities since he would do them for weeks at a time,” Dr. Motisi said. 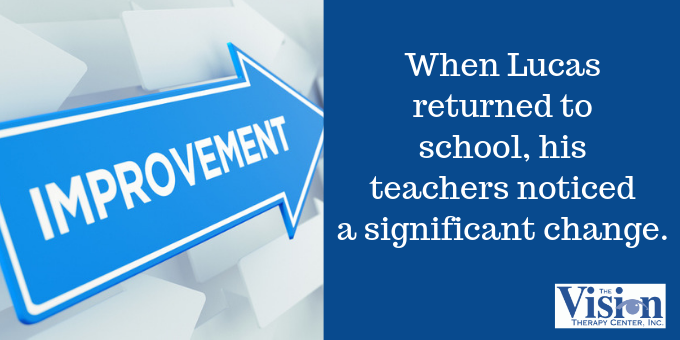 The change was so profound, it was noticed by another family, whose son was exhibiting similar symptoms. They, too, have taken their child to The Vision Therapy Center for testing. Lucas still faces numerous challenges. His developmental memory is lagging, and he’s reluctant to speak to his peers because of some of his speech issues. Not all of these issues can be attributed to vision problems, which Kelly and Tony are aware (Lucas also suffers from mutism). But Lucas is continuing vision therapy exercises and activities, 15 to 20 minutes in the morning. He will return for a follow-up exam in June, and the family will be eager to see the results. They are appreciative of the progress that Dr. Motisi and The Vision Therapy Center staff have helped Lucas make. 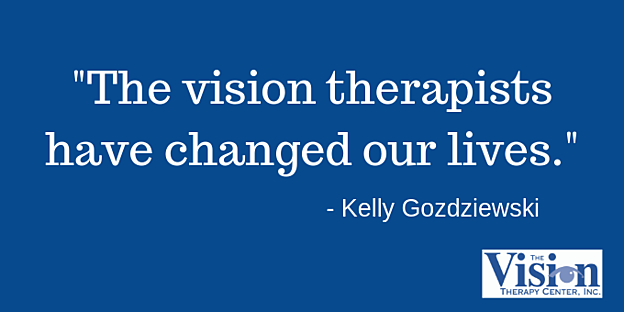 “The vision therapists have changed our lives,” Kelly said. “I wish we had found out about this eight years ago. Her wish is that more people learn about vision therapy -- especially the families who are struggling and finding no answers. 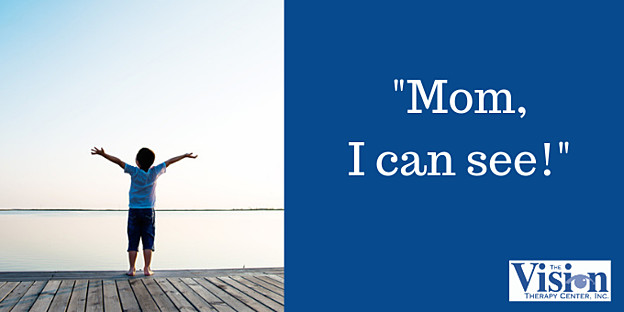 She hopes by telling Lucas’s story, she and Tony can help another family. In this section, we share some of Lucas’s diagnosis and clinical progress for fellow optometrists and medical practitioners. 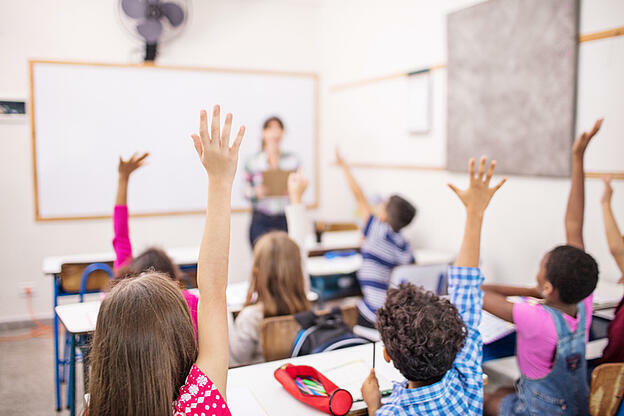 If you think you or your child may be suffering from a functional vision problem, the first step toward diagnosis is to take The Vision Quiz. It can help you identify if you’re suffering from any of the symptoms associated with a functional vision problem.